Storm the Castle! is a young band from Arkansas playing old school, epic heavy metal. I'm pleasantly surprised to hear a new, young band play this style of mostly forgotten metal. I hear a lot of influences from bands such as Omen and even Manilla Road in the compositions on this EP. The guitar work certainly leads me to believe that the guys have plenty of Iron Maiden and Iced Earth albums in their music collection. Of course, Storm the Castle! doesn't come close to matching the greatness of the aforementioned bands, but they clearly have a good thing going here, full of interesting ideas. This five track EP is the first recording from Storm the Castle! Currently, the band is searching for a label and planning a national tour. I do think that this demo is good enough to draw significant label interest, even though I can point to some areas where the band could improve. The songwriting and guitar work of the band are easily their strong points. In the promo sheet that was sent to me, the band makes it a point to talk about their bold and complex song structures that don't fall into the traps of mindless repetition or over indulgent shredding. While I have to admit that promo sheets can go a little overboard in hailing a band's strengths, this is an accurate statement. I hear a lot of musical talent in this band, but they don't compromise integrity of the songs with endless, indulgent solos to prove it. Instead, Storm the Castle! lets the songs speak for themselves. Epic song structures ensure that the music does not become repetitious or boring. Plenty of subtle time changes and shifts in tempo help out quite nicely in that regard. I'm sure you couldn't guess the theme of the music from the cover art (LOL @ the cover, by the way), name of the band, or song titles! In that regard, this EP reminds me of the lesser known, but emotionally charged underground released of the 1980's such as Manilla Road and Omen. Riffs such as the one found in Where is My Crossbow? have a definite Iced Earth flavor to them. Furthermore, the songs are chock full of dual guitar leads that sound as if they are coming from seasoned veterans of the metal scene along with vintage Maiden-esque rhythms. There are no keyboards or symphonic textures on this album; just no frills heavy metal delivered the old fashioned way, with heavy and creative guitar work. 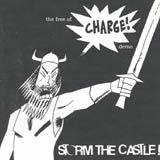 While the band's sound features some very obvious nods to some well respected old school bands, Storm the Castle! succeed in not sounding dated, or like a copycat retro band. While the individual musical performances and songwriting skills of the band are quite impressive, I was not as sold on the lead vocals. I do think part of my displeasure has to do with the very raw, demo quality production of the album, to be fair. The drumming sounds muffled at times, and under produced, and so I would have think the lead vocals would sound a lot better with adequate production as well. Still, the lead vocalist doesn't display much range at all on this EP. Mainly, he stays in what I would consider the lower end of the middle range. At times, his delivery sounds like James Hetfield, without the higher pitched shrieks (from their older material). There are also spots where the lead vocals are a bit pitchy, although they are not way off. To his credit, he does sing with intensity and emotion, perfectly fitting this epic style of metal. With a bit of work on expanding his range, I think he could add a lot more to the music. All in all, I think this is an impressive start for a band recording its first demo. I would really like to hear what these guys would sound like with label support and a proper recording budget. Also, as the musicians continue to refine their skills, I can only imagine that Storm the Castle! will deliver some impressive metal to a national (or even international) audience if given the chance. The name of this EP is titled as such for a reason. Visit the band's website (linked at the top of the review) to listen to this demo in full.